Can Spirals straighten out/ do they only curl one way? Please make sure you're spelling my username right! A lot of people miss a number or make one a vowel so please check your spelling or just copy and paste it if you're going to ping me. Is there still a plan for stage select for the coli be revamped so all the stages are on one screen? Long ago I remember mention of pages on the Coliseum venue page being temporary, until the code was rewritten to accommodate more than 16 items per page. I was expecting that fix with the Coli revamp but we still have two pages. Maybe it's just me, but I tend to avoid the venues on page two simply because of the extra step of having to go to another page to get to them, especially if I'm in grinding mode, because I have to reload often in the Kelp Beds and Golem Workshop. Are there still plans to fix this or are we going to have more than one page for the venues always? No Internet? Our clan is like Wakanda then, a hi-tech clan in the middle of a desert. Are mimics even organic beings? Or are they some sort of inorganic beings capable of mimicking any other life form? It would be so strange if the chest familiars such as Plasmime were organic and had a really odd skeleton. It just wouldn't make any sense. Where in sornieth are the coliseum ventures located? They aren't on any map. posted this on the wiki just now, as well: just though of this, but one of the new hintwords was "firefly," as announced. i had obtained a triplesight a few weeks prior to today, and now i am speculating. the firebug is similar to a firefly, and the hintword is firefly? this is kinda far-off, but yeah. [img]http://flightrising.com/images/cms/familiar/art/26128.png[/img] not to mention, but the familliar was recentcly released as well. just though of this, but one of the new hintwords was "firefly," as announced. i had obtained a triplesight a few weeks prior to today, and now i am speculating. 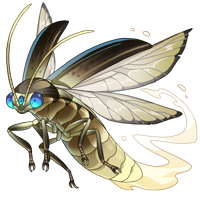 the firebug is similar to a firefly, and the hintword is firefly? this is kinda far-off, but yeah. not to mention, but the familliar was recentcly released as well. are some of the wrong answers to tomo's questions actually potential names for things that were being considered for stuff? like um... now i can't think of any off the top of my head. well one (that i hope is not the case) is about what kind of dragon is baldwin. but the ones i'm talking about are like the names of arena venues and holiday names and such. A weird question about familiars. So we have a lot of familiars based on/are an inanimate object, but they all have some explanation as to why they're classed as familiars, such as the Colubrid Column, (which has the souls of dead Serthis encased in it) and the Living Sculpture (It blocks those trying to cross its path), so you could believe them to be alive. However, we've had a recent one that's been bugging me ever since it came out. How is the Miniature Sornieth Globe a familiar? "Familiars are friendly creatures that inhabit the world of Flight Rising." The Globe has no magical properties, save for the fact that it hover above its base and the animated clouds, it has no "limbs" to imply that it can move on its own, and it's most definetely not a creature of any kind. So why was it a familiar?